Credit: City of Toronto Archives. Copyright was transferred to the City of Toronto by the copyright owner. Summer is a great season for theatre in the city. There are outdoor arts festivals and shows inside, if you prefer to escape the heat and bugs. While Toronto has a vibrant theatre scene today, its history is impressive as well. 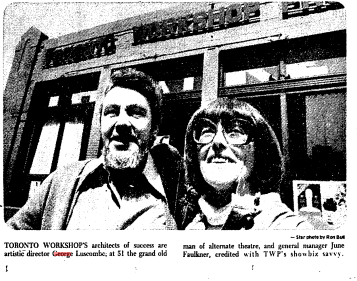 One of the major figures in Toronto’s theatre history is George Luscombe, who created Toronto Workshop Productions in 1959, when it was originally called Workshop Theatre. The group has been heralded as one of the great early alternative performance troupes, and one of Canada’s first professional alternative theatre companies. 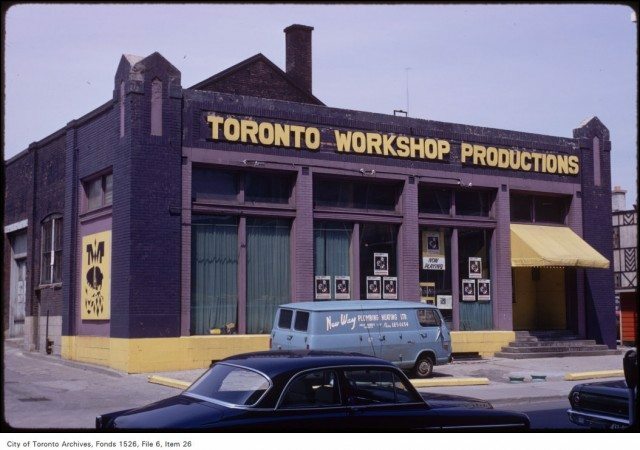 According to former-troupe member and drama instructor at the University of Toronto, Steven Bush, “WP was in operation some 10 years before important companies like Factory, Passe Muraille, Tarragon, and Toronto Free appeared,” he wrote in a 2015 journal article. “Theatre-makers in other parts of Canada would acknowledge George’s influence.” Bush says he was also likely the first director in Toronto to “practice ‘colour-blind casting,'” the practice of casting actors for roles without considering their ethnicity. Luscombe first got involved in the arts when he assembled a song-and-dance troupe with the Canadian Commonwealth Federation Youth Club to perform for striking workers on the picket line. In the 1950s, Luscombe moved to London, England, and worked with the Theatre Workshop under Joan Littlewood, where the company put on classic and modern plays and lived in a commune. Inspired by his time across the pond, Luscombe returned to Toronto and founded his own workshop. George Luscombe and general manager June Faulkner after the Workshop Productions theatre was saved by the city after public support. Photo from the Toronto Star August 24, 1977. According to Bush, “George was committed to original creation, to new looks at old plays, to strong political content and to building a full time paid ensemble of actors who would train as well as perform together.” Like Littlewood, he developed his work through rehearsals with the troupe. The play we were rehearsing kept failing to ignite us, but the news and the verbatim excerpts from the trial did. The testimony of poet Allen Ginsberg, Yippies Abbie Hoffman and Jerry Rubin, militant activist Linda Morse, Mayor Richard Daley, and others really got us going. The irreverent behaviour and imaginative wit of the defendants and their lawyers struck a chord. In the trial judge, we found a perfect villain: harsh, partisan, smirking, very smart and possessed himself of a wry sarcastic wit. In addition to improvising based on the court transcripts, the ensemble used an Alice in Wonderland-inspired structure, and referenced writers Fernando Arrabal and Marge Piercy to highlight the surreal nature of the proceedings. The play was a hit and ended up playing in New York and touring Europe. 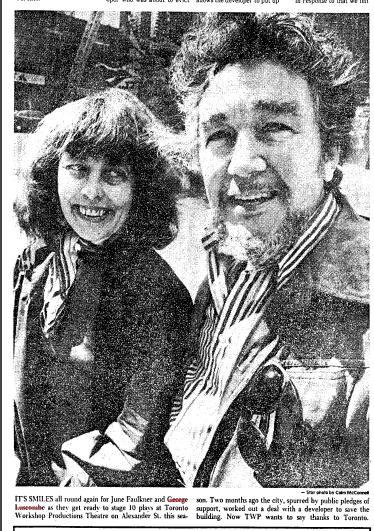 George Luscombe and general manager June Faulkner in the Star on April 22, 1978. Luscombe was named a member of the Order of Canada in 1981 for “contributions to the development of theatre in Canada.” He cut ties with the company in 1989 when the board of directors voted to fire him, and soon after to dissolve Workshop Productions. However, the theatre was preserved to always be used for arts and is currently home to Buddies in Bad Times. In his book, Filewood notes that because of Luscombe’s devotion to performance, he doesn’t have a legacy of scripts that can be reworked and reimagined by new generations of performers. His work was chiefly about the moment of being in a theatre and seeing performers on stage, which can’t be replicated. Luscombe died in February 1999. His plaque is at Buddies in Bad Times theatre, located at 12 Alexander Street. Check out some summer theatre this year. The annual SummerWorks Performance Festival starts August 4 (today!) and runs to August 16. Shakespeare in High Park runs until September 4.